It’s Bond. Great North Road-and-Bond. Still a rather wide road – but now with protected bike lanes and signalised bike crossings. Feedback is now open on Auckland Transport’s proposed design for where Great North Rd meets Bond St and Grosvenor St.
Our verdict: it’s good – and will be even better with a couple of tweaks. Be sure to have your say by Sunday 3 September! What we like – this will make the intersection safer for people on bikes. What we’d change – make it easier for people on bikes to turn right, especially to Bond Street, by adding a right turn pocket. 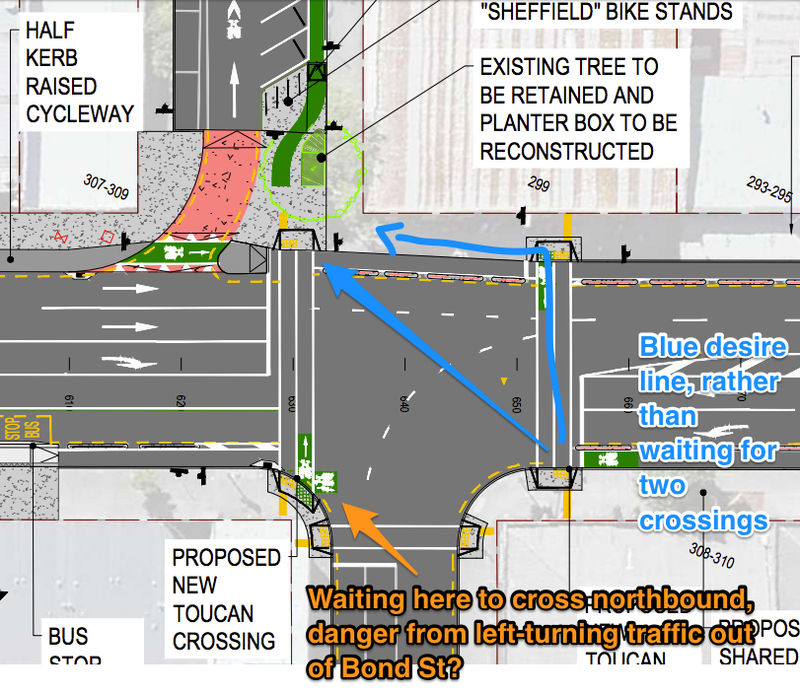 Other comments – we think there’s space for a proper bus stop bypass. As the next feature-length item in Auckland’s cycle infrastructure line-up edges closer to release, Auckland Transport – like any good publicist – is putting out some teaser trailers. The Great North Road protected cycle lanes, which got enthusiastic reviews in an early screening for critics* – but one particular vignette was kept under wraps: the new intersection of Great North Road and Bond Street, in Grey Lynn. *86% support in public consultation! This intersection is quite busy with cars, but is also a hub for bike traffic. Across the Bond Street bridge to the south lies Kingsland, and access to the Northwestern Cycleway. To the north is the link to the new Greenways Route through the heart of Grey Lynn. To the west is the Grey Lynn Town Centre, and to the east is K Road and the city. Whether local or passing through, a growing number of riders who have to deal with this large traffic-signalized intersection. So, how is AT proposing to lay this out for the public? The proposal has now been released, with the plan itself here. On the east side of the intersection, a new combined pedestrian-and-cycle signalised crossing – for those crossing the road towards Kingsland from the Greenway on Grosvenor Street, or turning right from Great North Road into Bond Street. One mystery is how people wishing to turn right here will step out of the way of through-cyclists while waiting for the signal. Plot twist: could AT add a sneaky hiding spot for a couple of bikes – like this feature at the the coming Ngapipi signals? Right turn pocket at Tamaki Drive/ Ngapipi Road. An existing signalised pedestrian crossing on the west is widened to allow bikes as well. This is for your right turns into the Grosvenor Greenway when coming from the city, or when you are crossing Great North Road towards Grey Lynn on your way back from a martini in a Kingsland bar. A raised eastbound cycle lane across the entry of Grosvenor (instead of the separator-protected sections elsewhere on Great North Road). The raised table at the entry will encourage vehicles to pause before crossing the path of cyclists going through towards the city. A new southbound contraflow cycle lane on the northbound section of Grosvenor, to allow two-way traffic for bikes into and out of Grosvenor. And finally, at the westbound bus stop on the southern side of Great North Road: the protected cycle lane will be raised up closer to footpath level for a section. However, this funnels cyclists along the bus-side, rather than via a bus stop detour as elsewhere on Great North Road. This seems to be the bad guy for bike people. A bus stop bypass would be a more logical plot point here, and there is space for one. Recent edit: We have just been told that due to the increase in production costs over the last couple of years (and a fixed budget), management has told the directors of this ‘movie’ to concentrate bus stop detours on higher-volume locations, like citybound. Sigh. Still missing is anything on Bond Street itself. We hear that the shooting budget for the Urban Cycleway Productions have increased quite a bit in recent years, and it is suspected (same as per the bus bypass above) that the extension to Kingsland had to be cut for a sequel. Support the overall concept. Good show, good show! Make it easy for people on bikes to turn right, especially to Bond Street, by adding a right turn pocket. Please consider adding a bus stop bypass – between the footpath and the proposed build-out, there’s definitely enough space. Bond. James Bond, on a bike. There also seems to be a problem for westbound cyclists who want to go straight through the intersection after waiting at the lights. Cars from the city will be trying to cut left across them, unless there’s a special early light for cyclists (like on bus lanes). An advance stop box here would improve this situation lot. I assume there will be a dedicated signal as seen on Nelson St. I wonder if it’s possible to have a ‘flashing amber’ cycle signal (cross with caution – give way to left turning cars) for the remainder of the phase, rather than a hard red. Probably that would overcomplicate the signalling though. Surely the amber flashing light is for motorists to give way to cyclists, as required by law. Yes, this (legally, not just preferably) needs a dedicated signal phase for bikes ahead and cars left stopped. We have raised the matter in any case in our feedback earlier, and will repeat it again. Why is that a legal requirement Max? No other cycle lane needs all left turning vehicles stopped? Because that lane into Bond Street is a Left-ONLY car lane. Legally speaking, whenever a dedicated turn lane has a green light (indicated with an arrow) then the driver can legally expect to turn with no conflicting traffic. If the cycle lane would run at the same time, in a crash, the driver would not be at (primary) fault (the signal engineer would be). Whereas most through cycle lanes around Auckland are to the left of “through-and-left” lanes, where drivers still have to give way to through traffic on the cycle lane. Some of those also have green left turn arrows (again, telling drivers “turn left with no conflicting traffic”), but that is a known, incorrect holdover which AT should be progressively removing from their existing intersections. Cheers for the clarification Max. It makes sense to make your way directly across GNR with the eastern toucan crossing, if that’s the first green you get. You would follow one of the blue arrows in my screencap. Neither of these actions are legally accommodated by the proposal, but will be popular movements I’m sure. If you get the green to cross Bond St first, the hook-turn waiting area appears dangerously exposed to left-turning traffic out of Bond St (This might not be an issue, depending on light phasing). Since the first westbound crossing is with the primary traffic flow, it should often be green anyway (though dependant on how the left turn is phased) – so should hopefully only one crossing wait in many instance. But correct, yes, you can also use the first crossing and then do as you showed with the hand-painted arrow.